When we live by that advice, though, we sometimes find ourselves chugging concentrated coffee at 2 a.m. in a valiant effort to stay awake and finish a huge project that’s due in 6 hours. As productive as I’d like to think I am… I’ve been there. If you’ve been there as well – or maybe if you’re there right now – this week’s video is for you. I’m not going to waste time lecturing you about the importance of planning, there are other videos for that – let’s just look at the best plan of attack when you find yourself in a time crunch. Now, we’re going to look at some specific concepts related to planning and willpower in a minute – The Impact Effort Matrix, Ego Depletion – but let’s start with the foundation: location selection. I think your location is vital when you’re working under pressure, and personally I like to pick my study locations based on their “vibe” – that is, what’s going on around me. I tend to favor coffee shops and libraries – I still go to my university library at times even though I’ve graduated – because I work well when I’m surrounded by other people who are also working. Also, close proximity to caffeine is helpful. The most important part of location selection, though, is avoiding the “call of the pillow”. 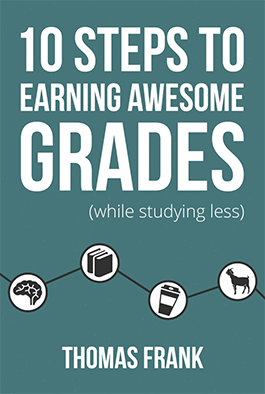 When you’re studying in a time crunch, it’s likely you’ll be doing it late into the night. That’s why you want to get as far away from your bed as possible. The later it gets, the more you’ll start rationalizing how good a nap might be and the more you’ll start deciding that certain parts of your project don’t matter. So pick a place where going to bed would be more effort than finishing the next part of your project. That piece of business taken care of, it’s now time to plan your efforts. Before you start working, take some time to break down your workload into individual parts. Then, it’s time to figure out which ones should get the bulk of your attention. In the book The 7 Habits of Highly Effective People, Steven Covey popularized the “Eisenhower Decision Matrix”, which is based on this principle. In the matrix, tasks are categorized based on their importance and urgency. When you’re in a time crunch, though, everything can seem urgent – so importance is the factor you should focus on in this case. To that end, let’s use a similar but more fitting tool – the Impact/Effort matrix. Here, tasks in a project are given scores based on their impact to the overall success of the project and the effort it will take to implement them. To illustrate how this works, here’s an example from my life. When I was a senior in college, one of my final projects was building a web app. My idea was called AMPanic, and it was an app that would require you to log in and tell if you’re awake before a certain time – otherwise it would send an embarrassing email to someone. This was actually the precursor to the early wake-up system I use now, which I detailed in this video. With this project, though, I found myself in a time crunch trying to finish it. So I broke my project down into different parts that I’d have to code and prioritized them using this Impact/Effort matrix. The core functionality – the code that would let you set an alarm and an email message, the code that would schedule and send the email on time, and the function to cancel the email if the user checked in on time in the morning – those required a lot of effort to build, but they also had the highest impact on the project. On the other hand, some parts of the site – like the About, FAQ, and Contact pages – didn’t have as high of an impact, but they were low-effort tasks. Since they didn’t take much time to create, I made sure to include them to make the site look more complete. The main element of the site that I chose NOT to focus on was the user registration and login system. A proper one needs functions for resetting passwords, but I decided that the core alarm setting functionality would be more important to my grade since that was the point of the whole project. So I used a login system I had written for an old project and didn’t bother creating a way to reset passwords. In the end, it was a worthwhile decision; the alarm system was more advanced than most of the other projects in the class, so I ended up getting an A. Use the bulk of your willpower to complete the harder tasks first; that way, you’ll only have to deal with low-effort, high-impact tasks when you’re feeling drained. That’s where we’re going to close for this week. If you select your location well, plan based on impact and effort, and tackle your tasks in a way that utilizes your willpower effectively, you’ll make if through your time crunch in one piece. Some viewers let me know they’d like wallpapers from some of the animations in this video, so here they are! I made them 1920 x 1200 – feel free to re-size them as you like. Click each one to enlarge it, then right-click the full-size version and hit “Save As” to download it. 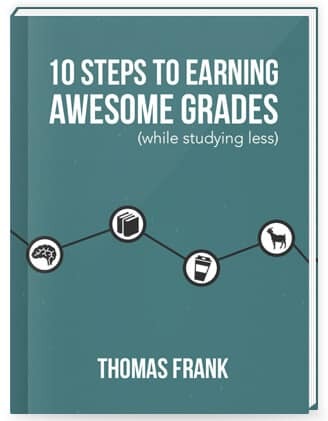 You’ll find more tips on planning, study environments, and maintaining willpower in my free 100+ page book called 10 Steps to Earning Awesome Grades (While Studying Less). What other topics related to working under tight deadlines would you like to see covered in the future?